I read this article and found it very interesting, thought it might be something for you. The article is called The Trend That’s Driving the Vending Machine Business and is located at http://www.healthyvending.com/blog/trend-thats-driving-vending-machine-business/. “There’s a trend nationwide about increased awareness of healthy eating” said Sean Kelly, HUMAN Founder, during a recent interview with Mike Allen of the San Diego Business Journal. According to Allen, “[f]or Vending Machine Operators, It’s Not the Candy That’s Dandy.” The dandy, according to Allen, is convenient health food. Many people do. To put it in perspective, on the last day of 2014 articles that discussed “easy dieting” were shared via social media over 23,000 times, those involving “quick healthy recipes” were shared a whopping 37,000 times, and a single BuzzFeed article about clean eating was shared over 10,000 times…in 24 hours. It’s pretty clear that a large number of people want to be healthier, but this doesn’t change the fact that 70% of Americans are still overweight. This means that there are potentially 220 million people nationwide that want to eat “better.” How many of these people live in your community? Who could you help? Sean Kelly believes that the obesity epidemic stems from a lack of convenience, and it’s worsened by a society that’s largely uneducated about nutrition—many people don’t know what constitutes “healthy” food, and they therefore tend to make “bad” food choices when healthy options aren’t easily available. At HUMAN, we agree that healthy vending machines are a great first step (it was our first step, after all) towards improving nutrition, but we’ve realized that, on its own, a vending machine business won’t make health food convenient enough for everyone. Why not? Think about it. Health food aside…does your community have convenient, regular access to vending machines in every location? Are your neighbor’s pantries filled with vending machines? Do local corporations use vending exclusively? If vending locations are prevalent in your city, it’s possible that a healthy vending only franchise might still be profitable. However, in our experience, locations that show significant returns from vending are limited to places like schools, hospitals, gyms, YMCAs, and the occasional business. 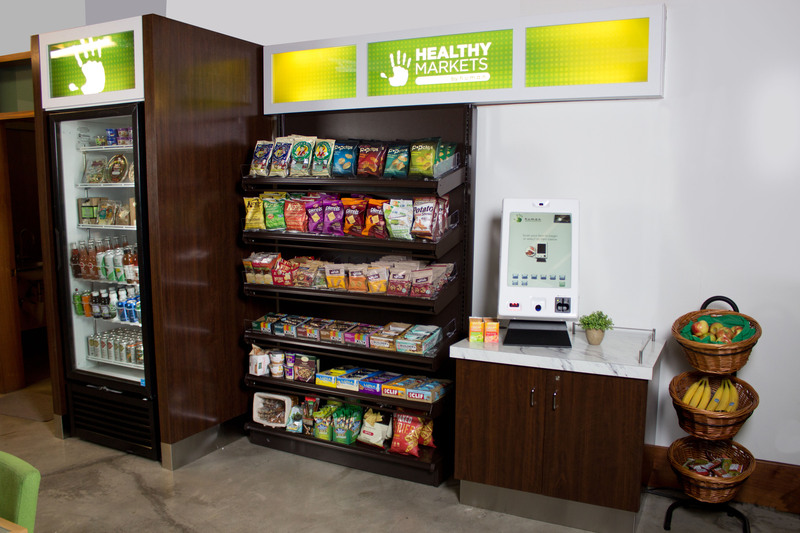 HUMAN had a huge amount of success in the Healthy Vending space; we were even ranked by Entrepreneur Magazine as the #1 Healthy Vending Franchise in North America. But, we knew that to really be able to create a profitable, sustainable business we had to help more people–to do this we needed to make healthy food even more convenient. Our solution was our incorporation of Healthy Micro Markets and SnackNation into our existing Healthy Vending program. The resulting HUMAN Platform provides our franchisees with multiple streams of revenue, a greater probability for success, and it’s also changing lives by truly making healthy food more accessible than junk food. The proof? Our Micro Market and SnackNation programs provide a much larger variety that’s a great solution for huge companies, like Apple, Tesla, the Oprah Winfrey Network, BlueCross/Blue Shield, and Edmunds.com, and for smaller businesses or homes (and locations where we don’t yet have franchisees) that we previously had to turn away due to a lack of profitability. When it comes down to it, the HUMAN Platform is better (and trends higher) because our programs are accessible to far more locations, and we therefore no longer need to limit ourselves to high schools and YMCAs. The result: we’re helping more people lose weight and keep it off, and our franchisees also have the ability to make a lot more money while doing it. The trend that’s changing the vending machine business is…you guessed it, convenient health food. As I’ve shown, most people want to eat healthier, but this proves to be difficult when the “good” choices are so much harder to find. HUMAN Healthy Vending started to make this easier, and the HUMAN Platform picked up the pace by creating solutions for even more locations. HUMAN is making junk food more inconvenient than healthy food for more people in more places. That’s why today, choosing healthier has never been easier, our franchisees’ profit potential has never been greater, and the HUMAN Platform is trending higher. Would you like to make more healthy options available in your community? Are you excited about the HUMAN Platform? P.S. If you liked this post, check out the last one I wrote about happiness being the key to business success. 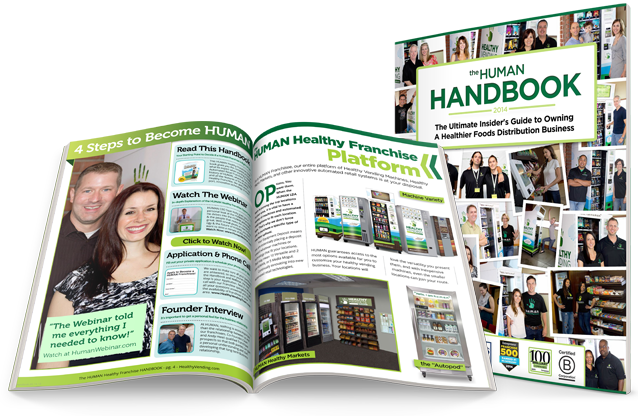 Everything you need to know about the #1 Healthy Vending and Health Market Franchise.